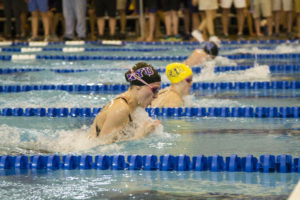 After winning three individual events at the 2019 NCAA Division III Championships – and setting a new national record in the process – NYU’s Honroe Collins was named Female Swimmer of the Year. David Fitch, a two time individual event winner for the Lords, and the rest of the Kenyon men’s squad will look to hold off Emory for the runner-up team trophy. Fiona Muir will look for her third individual NCAA event title, as she is the top qualifier after this morning’s preliminary heats of the 100 free. 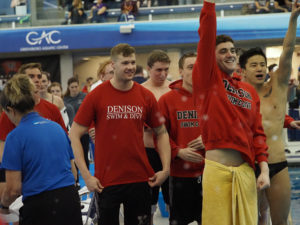 Day 4 ups/downs at 2019 NCAA Division III Men’s Championships. 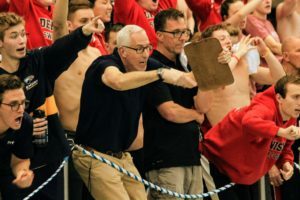 Day 4 ups/downs at 2019 NCAA Division III Women’s Championships. 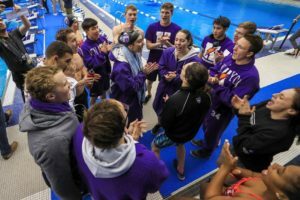 As they’ve stressed the importance of “winning the morning” throughout the duration of the meet, the Kenyon Lords will look to set themselves up for big points tonight. New York University’s Honroe Collins will look for her third individual title of these championships in the 200 fly, where she’s seeded 6th after the preliminary heats. 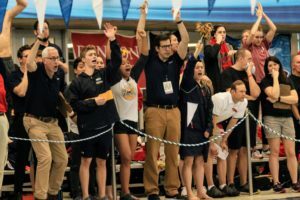 The Emory men look to reclaim their second place spot in the team standings, as the Kenyon Lords overtook them last night – the Eagles currently sit in third at 259.5 behind Kenyon’s 272. Olivia Haskell of Connecticut College took it out quick in the first circle seeded heat, but it was Wheaton College’s Brooke Barnes and Emory’s Lucena Daro who took the top two spots, the only swimmers under 51 point at 50.73 and 50.75. Haskell finished third with a 51.07. Defending champion Fiona Muir of Emory lead by a wide margin from the start, and despite receiving heavy chase from Kenyon’s Abby Wilson in the last 10 yards, she secured the top qualifying spot for tonight’s finals with a 50.14. Abby Wilson followed in tow with her 50.57, and her teammate Emmie Mirus cracked 51 for the first time to clinch third in 50.92. Hope College’s Meghan Peel crack two minutes en route to take the top spot in the first circle seeded heats, clocking a 1:59.56. 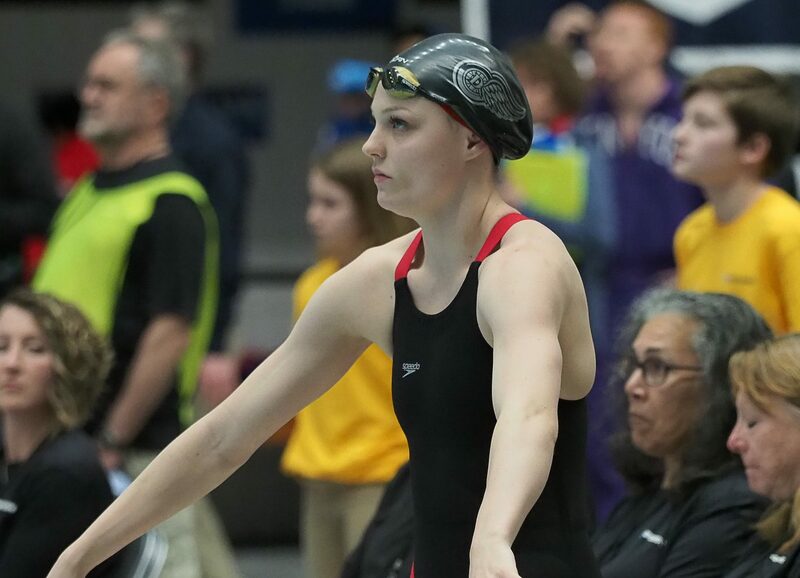 Chicago’ Gillian Gagnard picked up the runner-up spot from lane 1, swimming a 2:01.72; while Kenyon’s Summer Otazu claimed the third spot from lane 8 in a time of 2:02.69. In the next heat, Vassar freshman Jessilyn Ecklund and John’s Hopkin’s Sydney Okubu played cat and mouse for the first 150 yards, but it was Ecklund who ultimately topped the field in a time of 2:00.38. Okubu followed in close pursuit with her 2:01.39, and Trinity’s Mabel Fowler’s 2:02.99 earned her third in the heat. Defending national champion Crile Hart held a substantial lead from the get-go, taking the top qualifier spot going into tonight in a time of 1:58.18. MIT’s Laura Rosado had a big last 50 to overtake Kenyon senior Delaney Ambrosen, as the two took the second and third spots with times of 2:00.71 and 2:01.24, respectively. Williams’s Caroline White had a monster last 50 to win the first circle seeded heat in dominant fashion, recording a 2:14.15. Emory senior Ashely Daniels followed in pursuit to claim the runner-up spot in a time of 2:15.78, while Pomona-Pitzer freshman clocked a 2:18.11 for third in the heat. KT Kustriz, the defending champion from Denison, easily topped the field in the second to last heat in a time of 2:14.97. Emily Hageboeck out of Washington & Lee lunged to a second place finish in the heat, posting a 2:16.90. Amherst’s Nina Fitzgerald rounded out the heat’s top three with her third place time of 2:17.96. Freshman Jordyn Wentzel representing Saint Kate’s obliterated the field in the final heat, hitting the pad at 2:14.24. Kate Mesaros of Denison picked up the runner-up spot with her time of 2:16.95, while Eden Bates won the battle for third in a final time of 2:19.43. Emory’s team of Fiona Muir (50.73), Zoe Walker (51.57), Lucenia Daro (51.03) and Megan Taylor (50.76) easily won the first circle seeded heat in a final time of 3:24.09. Connecticut College’s squad picked up second in the heat with their time of 3:26.26. The Kenyon ladies also dominated their heat, as the quartet of Hannah Orbach-Mandel (51.36), Celina German (51.96), Abby Wilson (49.89) and Crile Hart (50.65) finished in a combined time of 3:32.86. Wash U.’s Catherine Cowin brought their relay home, as the Bears took second in the heat with a 3:25.67. Saint Kate’s took it out fast in the final heat, but it was Denison’s squad consisting of Mia Chiappe (51.92), Casey Kirby (51.15), Gabriella Nutter (50.79) and Maddie Hopkins (49.68) who secured the win in the final 100, registering a time of 3:23.54. Williams came back on Saint Kate’s for second, thanks to a 49.81 split from Laura Westphal, as the Ephs touched the wall in 3:25.71. Saint Kate’s held on for third in the heat with their time of 3:26.25. Denison’s Natalie Zarvella cracked 17 minutes in the morning heats to achieve a new lifetime best of 16:56.15. That time would have placed third overall last year. SUNY Geneseo’s Nancy Nasky dropped 12 seconds off of her entry time to clock a 17:00.10, which also would have netted her a top eight finish last year.